A number of artists featured in the special exhibition Of Heaven and Earth: 500 Years of Italian Painting from Glasgow Museums are represented in the collection of the Milwaukee Art Museum. This is the third in a series of blog posts that will highlight Milwaukee’s paintings during the run of the exhibition. Antonio Mancini (Italian, 1852–1930), On the Eve of Her Wedding, ca. 1882. Oil on canvas. Milwaukee Art Museum, Gift of Mrs. S. S. Merrill M1919.33. Photo by John Glembin. In researching a museum’s collection, the story behind the acquisition of an artwork can sometimes be just as interesting as the artwork itself. The Milwaukee Art Museum’s On the Eve of Her Wedding by Antonio Mancini (Italian, 1852-1930) is a great example. Mancini began his artistic studies at the age of 12. In 1875 and again in 1877, he visited Paris—then the center of the avant-garde world—where he met French Impressioninists Edgar Degas (French, 1834-1917) and Edouard Manet (French, 1832-1883). Mancini’s loose, expressive brushstroke and dark color choices were clearly influenced by Manet. At one point, John Singer Sargent (American, 1856-1925) declared Mancini to be the greatest living painter. In his 1880s work, On the Eve of Her Wedding, a bride-to-be has paused in her wedding preparations, a light-colored thread dangling from the spray of orange blossoms she is arranging for the next day. Her face rests on her hand, which in turn lies on the back of a chair. She is lost in her own thoughts, a smiling flitting across her face, her eyes sparkling in excitement, her cheeks red with anticipation. Mancini has perfectly captured a happy young woman in a private moment. Although Mancini has chosen a traditional genre subject, the composition feels very modern. The woman’s black dress is hard to distinguish from the dark background, but the light-colored details so important to the subject—her face, her hand, her flowers, and her thread—pop out at the viewer rather than blend together into a whole. The tipping of her head at a 90 degree angle to the direction of the canvas is slightly disorienting: her face pulls the viewer’s attention to the edge of the painting rather than the middle. On the Eve of Her Wedding came to the Museum in 1919 from Mr. and Mrs. S.S. Merrill of Milwaukee. Mr. Merril was Sherburn Sanborn Merrill, an executive of the Chicago, Milwaukee & St. Paul Railway. In 1879, he founded the railroad shops—where the workers would build and repair railway equipment—in the Menomonee Valley. To provide housing for the over 2,500 workers and their families, in 1883 he created Merrill Park between 27th and 35th Streets, south of Wisconsin Avenue and north of the Menomonee Valley. While in Italy, the Merrills purchased On the Eve of Her Wedding. Mrs. Merrill gave it to the Milwaukee Art Institute, the predecessor of the Milwaukee Art Museum, in 1919. The director of the Institute, Dudley Crafts Watson, wrote a glowing article about the acquisition in the Milwaukee Journal from December 7 of that year. Watson finished his announcement with the declaration that Mrs. Merrill’s gift was “proof of the place the institute has made for itself in the community and of its permanency.” He was right–here we are almost 100 years later, able to enjoy Mancini’s painting now part of the collection of the Milwaukee Art Museum. When our collection galleries reopen in 2015, you might see the Milwaukee Art Museum’s painting by Antonio Mancini. In the meantime, you can see a lovely example of Mancini’s work in the feature exhibition Of Heaven and Earth: 500 Years of Italian Painting from Glasgow Museums, on view at the Milwaukee Art Museum through January 4, 2015. 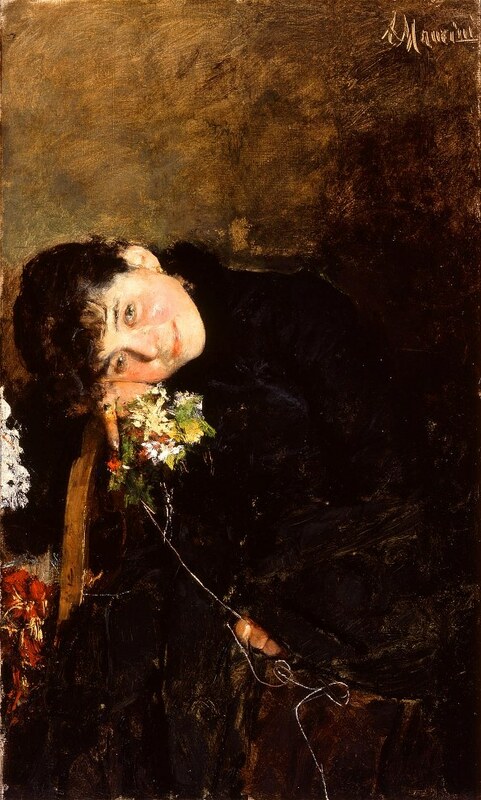 This entry was posted in Art, Curatorial, Exhibitions and tagged 19th Century Art, Antonio Mancini, European art, From the Collection, Italian art. Bookmark the permalink.